A muscle imbalance is when one muscle group is stronger than the other. Muscle imbalances can create poor posture, make physical activity more difficult and lead to pain. The key to correcting a muscle imbalance is to work all muscle groups when you exercise. Doing a variety of strength and stretching exercises can help correct muscle imbalances. Lie on your back or sit in a comfortable spot. Relax your jaw and tuck your chin in toward your neck. Hold the position for about 10 seconds, then relax. Perform 10 repetitions. Do this exercise up to three times a day to help restore muscle balance in the neck and back area. The chin tuck can be done virtually anywhere -- whether you are sitting at a stoplight or lying in bed at night. Stand in the middle of a doorway with your arms extended out to rest on the sides of the doorway. Lean your upper body forward, feeling the muscles in your shoulders and chest stretch. Hold for at least 20 seconds, then return to the starting position. Place your arms higher up on the doorway so they are over your head. Lean forward to stretch out the upper portion of your chest muscles. Repeat as desired. This exercise helps correct muscle imbalances in the upper body and upper back. Stand straight with your legs shoulder-width apart. 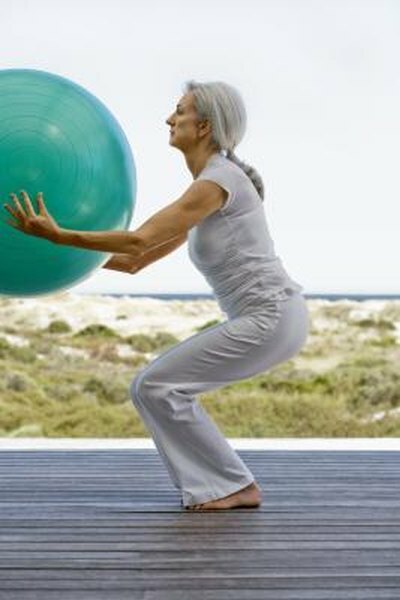 Hold an exercise ball out in front of you. Contract your abdominal muscles and bend your knees into a squat position. Pretend that you are sitting back into a chair. Rotate your upper body to the left, keeping your arms straight. Hold for three seconds and then return to the starting position. Turn to the right and hold for three seconds. Repeat for 10 repetitions on each side. This works a number of muscle groups including your arms, core and legs to prevent and correct a muscle imbalance. Extend your arms out to your sides, squaring your shoulders. Move your shoulder blades away from your spine by contracting the muscles at your sides. Do not move your arms forward -- keep them straight down at your sides and below your shoulders. Hold for 5 to 10 seconds and then reverse the exercise by bringing your shoulder blades together. Continue for five repetitions.